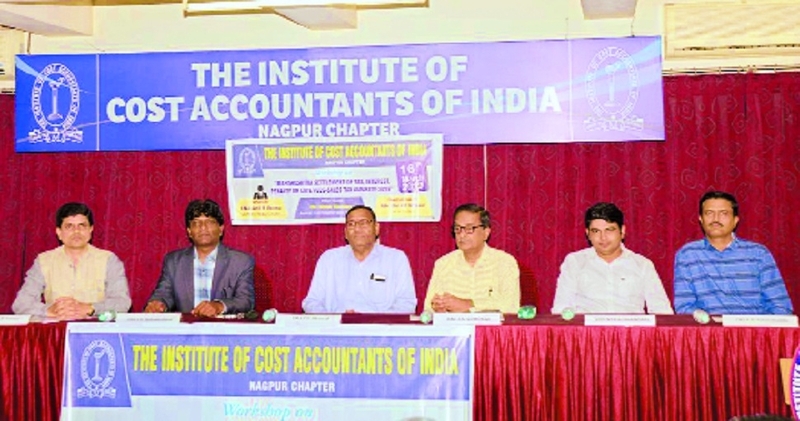 The Institute of Cost Accountats of India, Nagpaur Chapter in association with the Department of Sales Tax , Nagpur conducted a workshop on ‘Maharashtra Settlement of Tax, Interest, Penalty or late fees Sales Tax Amnesty 2019.’ The Chairman of the session CMA Anan Sahastrabudhhe welcomed chief guest Nilesh Bhandare, Assistant Commissioner State Tax (ACST) and guest of honour Advocate J K Gohokar. CMA Anil B Verma, Secretary Nagpur Chapter made presentation with various examples on ‘Maharashtra Settlement of Arrears of Tax, Interest, Penalty or Late Fees Ordinance-2019,’ Verma said that Ordinance on Amnesty Scheme for Settlement of Arrears of Tax was issued on March 6, 2019. It is applicable to Central Sales Tax, Bombay Sales Tax Act, Purchase Tax on Sugarcane, Professional Tax, Maharashtra Tax on the transfer of Right to Use, Motor Vehicles Entry Tax, Luxuries Tax, Maharashtra Entry Tax on Goods and The Maharashtra Value Added Tax, 2002. The Scheme consists of two phases, phase one will be from April 1, 2019 to June 30, 2019 and second phase from July 1, 2019 to July 31, 2019. Dealer or applicant is required to pay outstanding dues during this phase and file application to Nodal Officer in prescribed form I and he will be entitled to get relief under the scheme. Relief will be granted for disputed tax, interest and late fees or penalty to the extent of 30 per cent to 100 per cent . He appealed to the participants and others to take benefit of the scheme. Nitesh Bhandare made a powerpoint presentation and highlighted silent features of the Settlement Scheme. He said, no appeal is to be filed, and Scheme will cover statutory order dues, return dues, late fees and other dues against which no assessment was done so far ‘un-assessed dues,’ all pending assessments for all period prior to GST. He highlighted other important provisions full payment of tax if no dispute on tax amount i.e, ‘undisputed tax’ under original returns, revised return, VAT Audit report. Further partial payment of arrears of dues is allowed and proportionate waiver will be given, order passed and return filed before July 15, 2019 are eligible for waiver. Advocate J K Gohokar concluded the session by highlighting very important provisions. He said, even unregistered person (URD) can take the benefit of the Scheme. As far as dues of returns filed are concerned and if returns pertain to one financial year then one single application is to be submitted, before taking benefit of the Scheme the appeals pending before appellate Authority or Tribunal shall be withdrawn unconditionally. “If the applicant wants to withdraw the appeal partly, he can do so. In case, applicant makes less payment than the requisite amount, the authority will compute proportionate amount of waiver and if application is incomplete then designated authority will send defect memo within 15 days and within next 15 days the applicant will have to reply to it,” he said. Rectification of Settlement Order is possible within six months from the date of order. The Settlement order can be appealed to higher forum. Commissioner has power of review the cases within 12 months. Prominently present were CMA P V Bhattad, Past President of the Institute, CMA Shriram Mahankaliwar, Secretary WIRC, CMA Anan Sahashtrabuddhe, CMA A K Behra, Treasurer, CMA P S Patil, Director of Studies, CMA K M Rao, CMA G R Paliwal, CMA Malini Singhi, CMA VVS Murty, CMA S K Pathak and members in profession, trade and Industry. CMA Sonal Bakshi, conducted the proceedings.